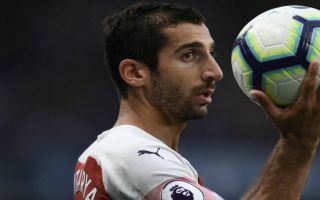 Arsenal midfielder Henrikh Mkhitaryan has backed new manager Unai Emery’s philosophy and concedes that the team is trying to move on from Wenger’s style. Arsene Wenger’s 22-year stay with the Gunners ended at the end of last season and former Paris Saint Germain boss Unai Emery was drafted in as his replacement. The Spanish boss immediately tried to stamp his authority on the squad by dipping into the summer transfer window, successfully acquiring the likes of Bernd Leno, Lucas Torreira and Sokratis Papastathopoulos. The new signings helped send a wave of optimism through Arsenal fans across North London, however, their start to the season has been less than encouraging so far. Emery’s men were pitted against Manchester City on August 12th for their Premier League opener at The Emirates, where they succumbed to a disappointing 2-0 defeat and struggled to contain the attacking threat of the reigning champions. They fared better against Chelsea on Saturday but still ended up on the wrong side of a 3-2 scoreline at Stamford Bridge. West Ham United await next weekend in their second home game of the new campaign and according to Mkhitaryan, the squad is prepared to work hard and progress gradually under their new coach. He told Sky Sports: “We know where we’re going, what we’re doing, what the coach is demanding from us and we’re trying to do that. “We can say we had a hard schedule having played Manchester City and Chelsea, but we had to face them now or later so it doesn’t matter. “We have to keep working because we have a new manager, a new philosophy and want to play in a different way than before under Wenger. “It’s not too easy but we are trying to achieve that and do what the coach is asking from us. He wants to play football and dominate the game and that’s what we’re doing, we’re not just kicking the ball up front. The Armenian midfielders latest comments will no doubt help put a realistic spin on the transitional period that the club is facing post-Wenger and supporters must exercise patience to allow Emery the time to stamp his mark on the team and lead them forward towards more successful times.